When something or someone is popular enough, people sometimes use it in satire or parody. Sonic is certainly popular, so sometimes companies or media do a parody of him. This page collects together even more items that are Sonic parodies. What exactly counts as a parody item? Something made by a company (not a fan) that's not officially Sonic, but makes fun of the franchise in some way that's pretty direct or obvious. Vague references in comics or shows don't count. 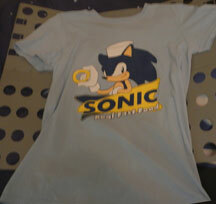 Bootleg items that are trying to pass off as official Sonic stuff don't count. For some good examples (or some good laughs)...see what's here! 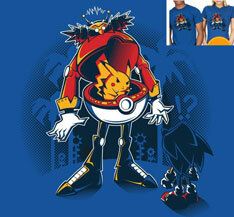 This is technically a parody tee, but it comes close to being very bootleg-like. It's a shirt for the band Son of Aurelius, however, for their mascot/tour they've just redrawn all the Sonic characters as zombies with pink worms instead of brains. 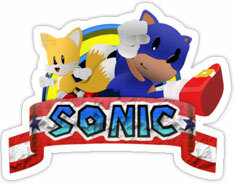 By removing the space they can get "Sonof" which makes it look more like "Sonic". As the zombies make rude gestures, the back has some kind of mutant modern Eggman with withered trees and rings flying all over the place. It's a very strange shirt. 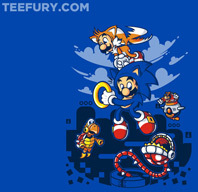 This is a TeeFury tee that parodies 2 things at once by sort of combining them. 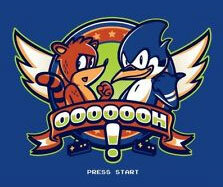 They use the Sonic 2 winged ring but then place "The Regular Show" characters Rigby & Mordecai instead of Sonic & Tails. 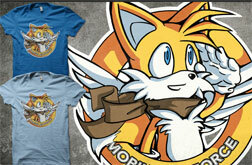 They've re-drawn them to be sort of Sonic-like, with Rigby's tail up & Mordecai doing thumbs up/Sonic type eyes. The ribbon just says "Ooooh" so they didn't write out the name of either thing they're parodying. 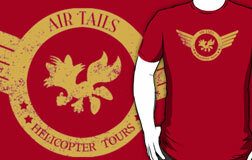 An interesting shirt for fans of both properties. 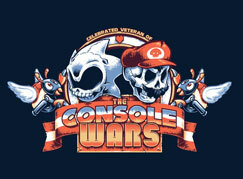 Now HERE'S a funny in-joke semi-parody tee or sticker design. It's made by the parody company/site Redbubble...but it doesn't actually parody anything. Actually, how they got away with the design is unknown. 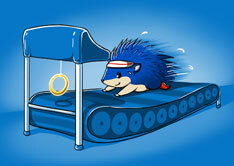 It uses the actual Sonic logo & winged ring, but scribbled out. 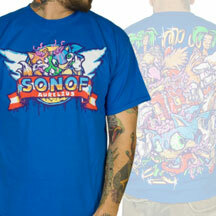 Then it uses Scratch, Grounder & Coconuts from the AoStH (Weekday Sonic) show. So nobody's making fun of anything here, and the likenesses aren't altered for parody purposes either. 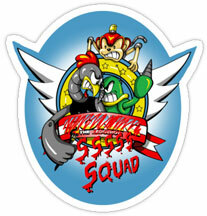 The in joke is from the show directly "SSS SS Squad" which...since it's a poor acronym was actually made up by Scratch & Grounder, to help illustrate that everything they did wasn't the best.. 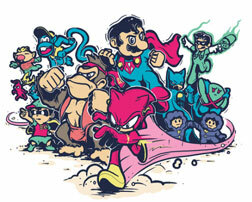 It's the "Super Sonic Search Smash Squad". 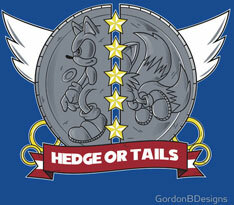 The design itself is called "Hedgehog Hunters". 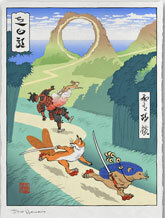 You'd really have to be in on Sonic history to recognize what's going on here, but that seems to help the fun. 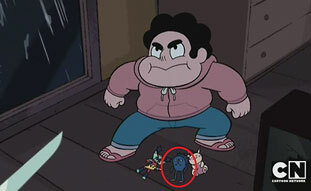 Steven Universe is at it again. They're watching the continuity in the show (I guess) because that "Gotta go fast" circle thing Sonic "art" that was a toy on the shelf (above) gets onto the floor in a different scene. The pikachu-like thing is down there too, but in this scene it looks like the character is being threatened by someone with a knife at night. What is this confusing thing? It was labeled "Sonic The Hedgehog Gargamel Kaiju Monster Figure" which is obviously spamming in popular words to get people to look at it. At a casual glance, it appears to have nothing Sonic like about it, but if you look at the thing's "Hair" or whatever that is on the back of the head, the configuration of it is clearly exactly Sonic's spikes. The eyes are like a narrowed/sqished down version of Knuckles' eyes, & the ears are clearly Sonic-like too. 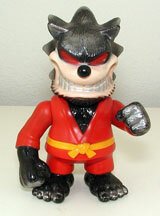 Why the thing is in some karate suit & has silver hands is a mystery.